Gilbane is responsible for the construction of a modern facility that will provide shared laboratory, research, and academic spaces for multiple disciplines. 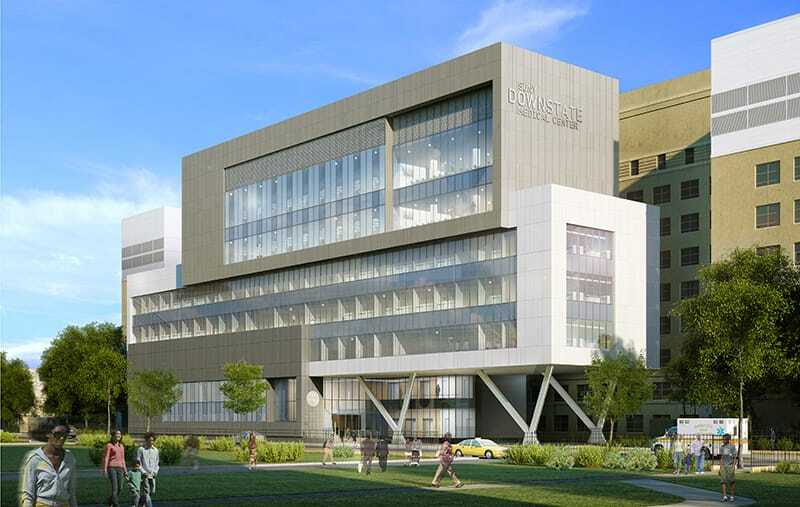 Gilbane is providing construction management services for the construction of a New Academic Building (NAB) for the School of Public Health on the active SUNY Downstate campus. The NAB will be located directly in front of the existing Basic Sciences Building (BSB) along Clarkson Avenue, creating a tight and complex project site. The project consists of a new eight-story building, and renovation to the existing BSB including relocating the main entrance to the facility. The NAB will contain classrooms, offices, conference rooms, medical simulation centers, research laboratories, food service, and other support spaces. Research lab centers, which will group researchers with similar interests and goals, healthcare simulation centers, research center laboratories, and academic spaces for both the School of Public Health and the School of Medicine together in one shared facility. The project will be registered and certified as LEED Silver rated.